Achievement Center for Therapy / Feeding Therapies / Is Your Baby Really Ready For Solid Foods? 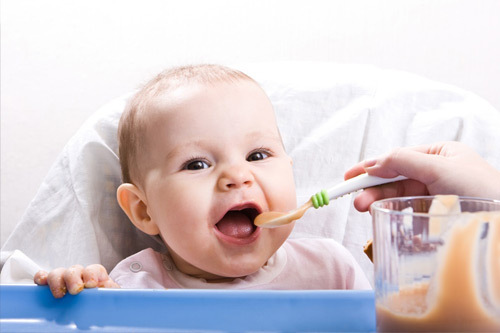 Is Your Baby Really Ready For Solid Foods? Many articles and professionals suggest that babies start eating solids at 4-6 months. I have many reasons why I believe that six months of age is the best age to begin with solid foods. At six months your baby has more time to mature and reach developmental milestones, acquire better digestive system development and have increased overall readiness for this complex but exciting process of feeding. Tongue thrust reflex or extrusion reflex- Your baby does not push food out of their mouth. Sits upright with very little to no assistance. Has doubled their weight since birth and is at least 4-6 months old. Baby opens up when you bring the spoon of food to their mouth. Baby shows interest and curiosity in your food. Imitates eating behaviors like chewing motions and smacks lips.